Welcome back to another week here on the blog! I am posting a little late this week, but better late than never right?? 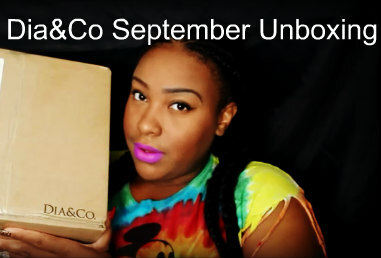 This week is all about Dia&Co, and I am starting off with my Dia & Co September unboxing! I am excited that Fall is coming, so I was thrilled that a box was coming to prepare me for the new upcoming season. BTW click here to check out the 4 Looks, 1 Piece video, and vote in the poll which piece you want me to style next! Enough of the chit-chat, let’s get into the video! Did you enjoy?? I hope so! If this was your box what would keep or send back?? Find out what I decided to keep or send back, and also what the pieces look like tried on by checking out tomorrow’s Try on and styling video!! Listed below is a quick rundown of the items in this box! Ladies that’s all for today’s video! Be sure to come right back here tomorrow for the styling and try on video for this month’s Dia box! Are you following me on social media yet?? Because you should be! Click on the links above to stay connected with me and the blog! So until we meet again, I love you lots like tater tots and I will see you ladies tomorrow!